One of my all-time favorite beetles is beginning to showing-up on trees and shrubs in southwest Ohio. This is the time of the year when populations of many soft-bodied insects such as caterpillars and sawfly larvae begin to rise. 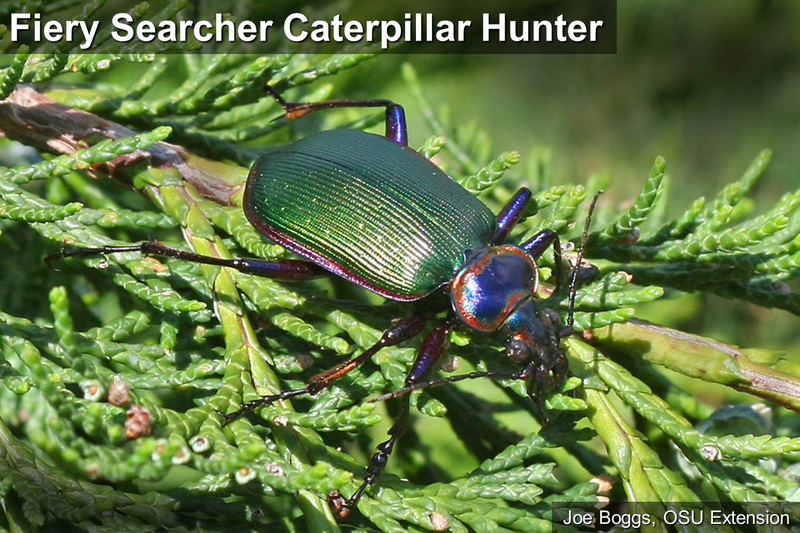 It's not coincidental that this is also the time of the year when Fiery Searcher Caterpillar Hunters (Calosoma scrutator) begin to appear. This colorful predacious beetle feasts on free-range caterpillar meat as well as on any other soft-bodied insect that it can clamp its mandibles on. Indeed, this beetle is considered one of the more significant insect predators with the capability of having a substantial impact on the population densities of general defoliators. Fiery searchers measure around 1 1/4" in length and are one of the largest sized "ground beetles" (family Carabidae) found in Ohio. The beetle has long, purplish-black legs and antennae. The abdomen is almost rectangular, with the posterior end slightly pointed. The hardened front wings (elytra) that cover and protect the abdomen and membranous hind wings are metallic green with fine longitudinal grooves. The outer edges of the elytra and the prothoracic shield; the flat structure just behind the head, are lustrous reddish-orange. This striking color feature that is responsible for the fiery common name. The front end of the beetle, the business end, sports sickle-shaped mandibles used to reduce hapless caterpillars into beetle fodder. Adults may live for 2 to 3 years, spending the winter beneath bark or in the soil.